We at MILSIG Canada are proud to be Canadian and we are thankful to live in this wonderful country and forecer grateful to all the Canadian men and women sacrificed so much to make Canada the free country that it is today. We would like to personally thank our veterans and soldiers currently overseas for all that you've done to protect our country and ensure a secure and free nation for ourselves and our future generation. Please stay safe and sharp out there and God bless Canada! 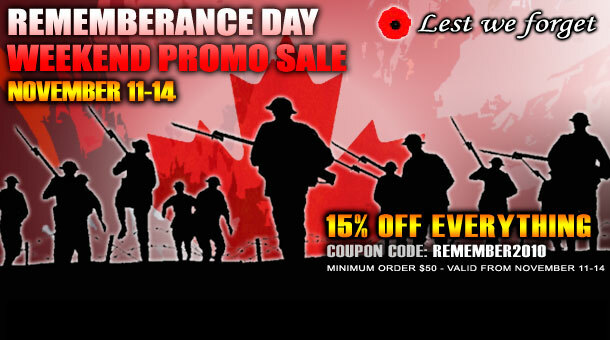 Receive 15% DISCOUNT on your purchase for all orders over $50 placed through our online store during November 11th 12:01AM to November 14th 11:59PM. Use Discount Coupon Code: REMEMBER2010 on Step 2 of 3 during Checkout on the Payment Information page. The 15% discount will be deducted from your total and the final total will reflect this discount. Our office will be closed on November 11th for Remembrance Day. " If you've followed our review of Milsig products and have been on the fence about getting something, now would be the time. 15% is a pretty good deal, worthy of its placement in No Money November.